Why 5 association sector challenges for 5 years? Well, it’s all about me. 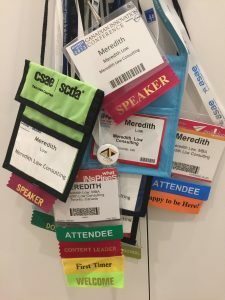 And this is the week where I would be walking the stage in our formal graduation with the rest of my Certified Association Executive (CAE) cohort – if I could have been at the CSAE National Conference in St. John’s. So at this double milestone I thought I’d sit down and think about some big questions: what will the next five years look like? What will we be challenged by in the association sector? What will we all be working on, and talking about? No normal is the new normal. In the past year alone I’ve interviewed people for associations – members and stakeholders – who’ve been affected by wildfires, drought, record rainfall, threats to NAFTA, BREXIT, artificial intelligence, and currency fluctuations. Plus drones. And probably offshored, internet-of-things robots too. The VUCA world (Volatile, Uncertain, Complex, and Ambiguous) has already arrived for many of us. It’s coming for everyone else. Are you ready for this? Can you anticipate how it will play out in your sector? Boards that are strong, not just in terms of basic governance, but in terms of real performance and strategic vision. Chief staff officers who are fearless, flexible, and fast on their feet. People you’d want to follow. And who are well-supported by their board. Does your organization have the leadership it needs, based on the context you are facing? Are you building the kind of organization that strong leaders will want to lead? Does your board really understand its role? I talk to a lot of association leaders who anticipate retiring from their current job – not in decades, within a few years. I talk to a lot who are interested in bigger challenges in their next job. I talk to a lot more of the former, and way fewer of the latter. 3. Can you handle a changing reality? Industries and workplaces are being reinvented, disrupted, and broken up and put back together. But associations tend to map to specific, often rigid, categories – members are often members because they have qualified in a very specific way. The overlapping, fluid workplace means associations need to rethink boundaries, and disruption challenges trade associations. Do you think about the work, or the strict professional categories? Do you think about the service provided, or the companies currently in place who provide the service? This is often a discussion about organizational structure, or membership categories, or strategic alliances with other associations. And it’s often the absolute hardest discussion to have. What do you take apart, and what do you put back together? How can you remove the institutional barriers to collaboration with adjacent associations? How can you negotiate the political dynamics within your field? The companies and professions that constitute the membership of trade and professional associations are, by definition, the incumbents. By the time an emerging field has come together and created some structure and common language, it’s already chockablock full of a status quo to protect. Associations themselves are grounded in membership, and that makes them conservative in their thinking – just in the sense of taking things slow. All this adds up to a sector that struggles with innovation. Old ways are stubborn, and often with good reason. But if we accept that changing times are upon us, and that new solutions might be needed, we need to think about how best to do innovation in an incumbent-oriented environment. …this is where I get worried. Associations generally aren’t early adopters of technology. But technology has to get much more central to the way we think about how associations function. There are opportunities to leapfrog over some transitional technologies by some associations, but the ability to do that successfully is a strategic/business question, not a technical one, and that thinking isn’t always done well. These are my 5 ideas – what would you add? If you are looking for some help in figuring out how to make sure the next five years are great for your association, please get in touch. Photo by Meredith Low, all rights reserved.